10/12/2009Share this story on Facebook! 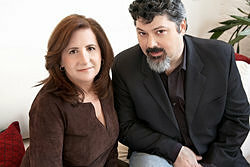 Award-winning filmmakers Tia Lessin and Carl Deal are just two of the many independent journalists the Park Center for Independent Media has brought to campus to speak to students. Tia Lessin and Carl Deal wanted to make a movie about Louisiana National Guardsmen who’d fought in Iraq and were now being asked to help restore order in New Orleans in the aftermath of Hurricane Katrina. Instead, a chance meeting at a Red Cross center with a young couple who’d filmed the disaster on a camcorder led them to direct and produce Trouble the Water, an Academy Award-nominated documentary which screened to a packed house at Emerson Suites last month. "They lived through a nightmare." 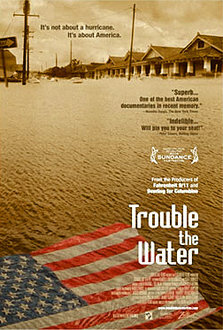 With no sit-down interviews, no statistics, and no explanatory subtitles, Trouble the Water doesn’t feel like a traditional documentary. The film covers the lives of Ninth Ward residents Kimberley and Scott Roberts from the day before Katrina through the storm itself and the two years following. The story highlights the struggle the people of New Orleans went through while still sharing their sense of optimism. "But the real disaster was about to begin." With unanswered 911 calls and no emergency rescue system, Katrina’s victims were left to seek help on their own. Even a Navy base with vacant rooms refused to shelter victims of the disaster, with soldiers eventually threatening to open fire. Sponsored by the Park Center for Independent Media, the screening ended with a Q&A session with the filmmakers. “The government abandoned New Orleans before the hurricane hit,” Lessin told the audience, citing the feds’ failure to prepare for rescue relief and their knowledge of the levees’ inability to withstand the storm as examples. This, she said, was occurring all while the U.S. was spending $350 million daily on the war in Iraq. In a much more intimate setting the following day in the Park Auditorium, Lessin and Deal led a discussion of the pros and cons of making independent films. They showed clips from their past work and from their upcoming documentary Dragnet, about the deportation of supposed “terrorists” from the U.S.
Lessin said she enjoyed seeing and talking with students who may continue in her path.